Little Thumb has developed a unique geolocalisation concept by combining various technologies that can be deployed according to the type of environment. They represent the basic elements of the LittleThumb solution. A clear printed logo makes it easy to recognize the StoneTags and the user only has to approch his NFC equipped smartphone in order to obtain an accurate position instantaneously. The StoneTags can be installed indoors as well as outdoors. 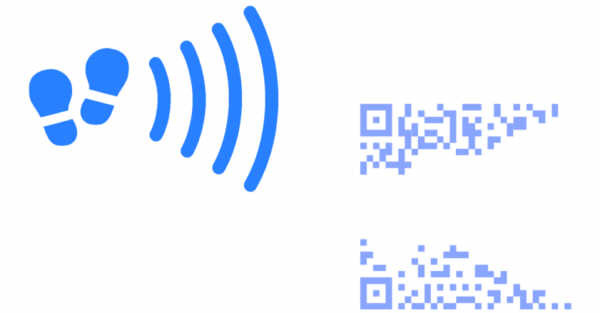 In order to ensure compatibility with all the terminals (not equipped with NFC technology), the StoneTags also include an image code (similar to QR-code), recognizable using the camera of the terminal. Smartphones are equipped with a magnetic compass, an accelerometer and some of them with a gyroscope. These sensors allow to obtain quite a precise estimation of the orientation and movements of the user during a short period of time (afterwards, the precision decreases due to the drift over time). LittleThumb uses these sensors in order to ease the orientation while the user navigates in a complex environment. At each new reading of a StoneTag the sensors are readjusted, allowing a precise estimation of the orientation and movements of the user (dead reckoning) to be provided again. Recently launched on the market, BLE beacons broadcast a signal that terminals compatible with BlueTooth 4.0 can interpret. Characterized in the cartographic model by their position and their reception range (typically 3 to 10 meters), these beacons are suitable for wide open areas where an extremely accurate precision is not critical. WiFi is not a very suitable technology for geolocalisation, but it has the advantage of being present everywhere. LittleThumb uses WiFi only in the symbolic way "I receive, therefore I am", as a complement to the StoneTags. Reception areas corresponding to a minumum range are mapped and allow for a rough localisation (10 to 20 meters). The WiFi technology is thus used mainly in order to detect an error on the navigation path, or, as the BLE beacons, in crowded or wide open areas. The use of GPS technology in pedestrian outdoor environments is facing the problem of "urban canyons", which decreases the availability and the precision of the position. LittleThumb uses GPS only when the reception conditions are acceptable, i.e. in wide open areas, in addition to other available geolocalisation technologies.